Step up to danger with confidence in these Made in the U.S.A. leather Structural bunker boots with a roomier, more comfortable oblique toe. The StedAir® PTFE waterproof, breathable membrane keeps dangerous fluids out when you wade into hazardous situations. Our exclusive Vibram® Fire & Ice chiseled edge sole with chiseled edge lugs provides exceptional traction on any surface. It stands up to the heat and will help keep a steady foot when fighting winter fires and the water turns to ice. The Aztec lining wicks away moisture, while the removable contoured cushion insole maintains comfort no matter how long you’re on your feet. A steel triple-rib ladder shank and Lenzi Li-Protection® puncture-resisting insole provides a barrier between your feet and whatever you have to walk over or climb to put out the fire. 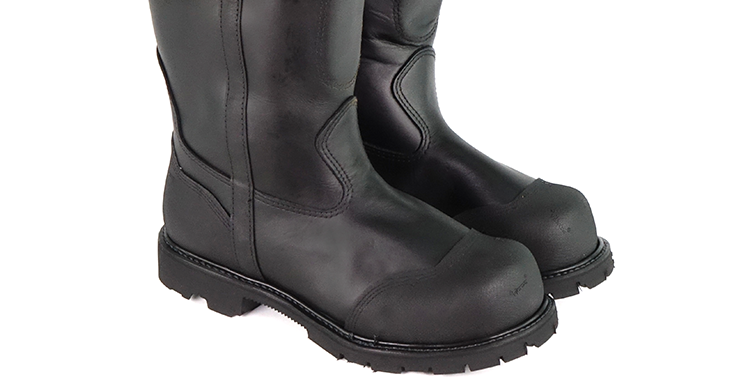 These NFPA boots are built to work as hard as you do, for as long as you do.